Elioth Gruner was an Australian painter and winner of the Wynne Prize seven times. Elioth Lauritz Leganyer Gruner (16 December 1882 – 17 October 1939), was an Australian painter and winner of the Wynne Prize seven times. 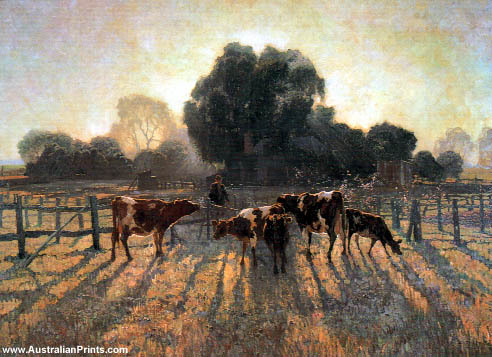 A painter of light-filled rural landscapes, New Zealand born Gruner arrived in Australia in 1883. He studied part time under Julian Ashton at the NSW Art Society, working during the day as a draper’s assistant and later as a window dresser. He suffered from early financial hardship, becoming the sole support of his family after his brother’s death in 1898. Ashton recalled that Gruner was so poor he could only afford the three primary colours plus white. By 1901 his first work, a still life of violets, was accepted for hanging in the Society of Artists Spring Show. His earliest-known works are small oil sketches of beaches around Sydney, 1912-14 very much in the tradition of the 9 x 5 Impressions of Streeton and Roberts. 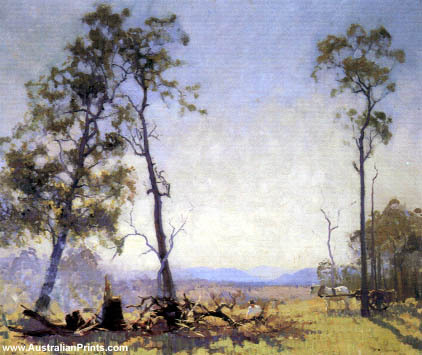 In 1915 he visited Melbourne and came under the tonalist influence of Max Meldrum. Gruner’s success was assured when in 1916 he won the Wynne Prize for landscape, a prize he was to be awarded six more times. Artist information page for Elioth Gruner. This article uses material from the Wikipedia article Elioth Gruner, which is released under the Creative Commons Attribution-Share-Alike License 3.0.